Makes up to 7 pints of IPA - don't drink it all at once! What’s that? You need a hobby that doesn’t cut into your beer drinking time? Well, we happen to have the perfect idea! Or, should we say, perfect i-beer? No, turns out we shouldn’t say that. But, we will say that you’ll have a tasty time brewing your own beer with this Brewdog Punk IPA Beer Making Kit from the Brooklyn Brew Shop! Home brewing is a fantastic hobby, but the initial phase of getting all the equipment can be a little challenging, to say the yeast! But, with this kit, you don’t have to worry about going on a treasure hunt just to find everything you need. 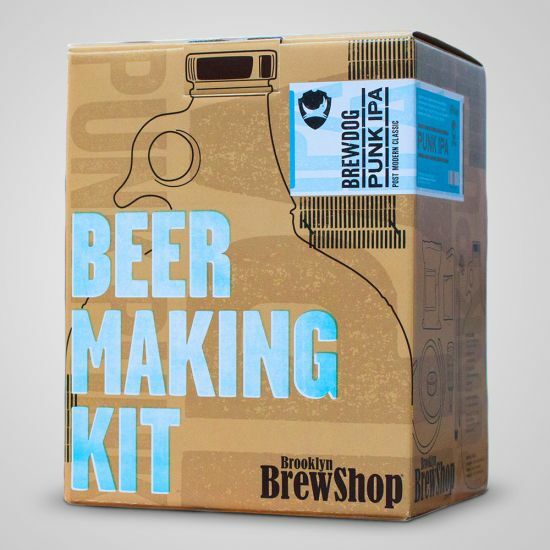 This beer making kit contains ale you need to have a very hoppy time! Inside, you’ll find a gallon glass fermenter, an airlock, tubing, a tubing clamp, a thermometer, sanitiser, a stopper, some other goodies, and, of course, malted barley, hops, and yeast! This kit is designed to make stove-top brewing easy, so don’t worry about it being too tricky. In fact, there’s barley any learning curve! Just follow the instructions, let it carbonate for about 2 weeks, and you’ll have up to 7 pints of your own, very punchy, 5.6% ABV, Indian Pale Ale! Is brewing your own beer awesome? A-ferment-ative! So, to make the nectar of the gods in the comfort of your own home, and have a pale ale of a time doing it, be sure to get your Brewdog Punk IPA Beer Making Kit today! Some additional basic kitchen utensils required.